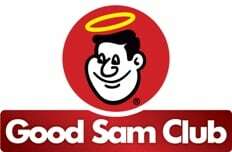 Welcome Good Sam Club Members, Families, and Friends! No power or hookups are available. There is an informational meeting at the River Run Lodge for ALL RV Campers. Be sure to save the date and make plans to attend this meeting. There will be a greeting by the one of the directors of the Sun Valley Jazz & Music Festival and a special musical performance. This has been a big hit each year! Attending this meeting is of particular importance for first time RV Campers to the festival because it will familiarize you with all of the details. Parking for Recreational Vehicles will be located at River Run Lodge. As you come into Ketchum (northbound on Highway 20), look for the RV Parking sign on your left. The fee reserves a spot for you on a first-come, first-served basis and includes the use of the River Run Lodge #2 facilities. Your Registration fee can be purchased online only. A Good Sam Club representative will be on-site at the RV Lot and will have all programs, badges and passes for those who used the Good Sam Club special coupon code for this event. Your name WILL NOT be on the list at all at the Jazz Sales & Will Call Office, so be sure to go to the RV Lot to pick up your credentials and passes. Regular ticket sales are available at the event starting Tuesday, October 18th at Noon.